Let Legends Roofing take care of your roof replacement for your commercial enterprise. When a roof starts to fail, business owners can expect to see all aspects of their business building affected. Water damage and mold can cause your expenses to skyrocket. 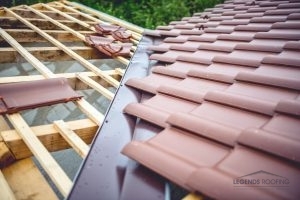 Avoid roofing catastrophe and schedule a roof replacement in Dallas, TX with Legends Roofing. We install roof replacements that take care of all your roofing troubles at once. After installation, we will continue to perform necessary roof maintenance on your new roof so you won’t have to worry about a bad roofing experience again. Call us today at 214-321-3293 to get started on a roof replacement for your business! EPDM can last you up to thirty years if you decide to use this durable roofing material for your next roof replacement. Our Legends Roofing contractors are highly skilled and more than certified to install this great roofing material for you. You can have EPDM roofing installed as a replacement in the color of your choice too. To further improve the performance of your roof replacement, ask about adding an energy efficient roof coating. Metal roofing is fantastic because it offers many styles and combinations of composition. As a business owner, you can opt for strong and classic looking stone coated steel roofing or simple and stylish galvanized steel roofing. Whichever you choose, know that your contractor at Legends Roofing will install your new roof perfectly so your worries about roofing troubles will be minimal. To avoid early roof replacement in the future, you can schedule regular roof maintenance where a roofing expert can keep you informed about needed roof repairs. Legends Roofing will have answers to your questions about roof replacement in Dallas, TX. Our skilled workers have had nearly two decades experience in the field and offer expert advice on the next step. To speak with a representative, call 214-321-3293. If you don’t think roof replacement is necessary for you, visit with one of our customer service agents. We can get you set up with a roof coating or roof restoration for your distressed roof. Updated on August 4, 2017 at 1:29 pm by Legends Roofing.